Tooth decay is one of the most common dental problem experienced by many. The condition occurs due to the plaque build-ups on the enamel that produce acids when foods with sugar are eaten. The acid attacks the teeth and eventually wears down over time resulting in cavities. It may start small, but if left untreated it can grow bigger and even spread to other healthy teeth causing many dental complications. 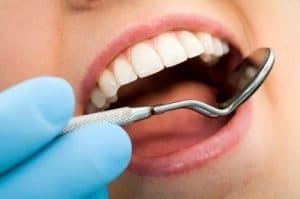 Tooth decay should not be taken lightly since the dental problems it can cause may worsen and even affect the overall health and wellness of a person. At The Holistic Dental Center, we offer a service which helps in the early detection of tooth decay. The device we use can pinpoint tooth decay beneath the tooth’s surface that cannot be detected by x-rays. It is an effective treatment that can help many patients prevent the hassles associated with tooth decay. Diagnodent is a device that uses a high tech laser fluorescent that can detect cavities even to teeth that appears intact. It is highly useful especially for the deep grooves and pits on the molars and premolars which are more prone to decay. Fruits and vegetables that are rich in fiber like (apples, celery, and carrots). Fiber-rich foods help in the stimulation of saliva production in the mouth. Saliva is an essential component that serves as a natural rinse on the mouth. It washes off food particles stuck on the teeth or other hard to reach areas. The crunchy texture of these products also serves as a natural scrub on the teeth that helps remove harmful build-ups on the enamel. Dairy products (milk, plain yogurt, cheese, and more). These products are good for the body in so many ways and also for the teeth. It contains minerals such as phosphates, vitamin D, calcium that are needed for the teeth to stay healthy and strong. Dairy products also have the added benefit of neutralizing acids on the mouth which lowers the risk of acid attacks on the teeth. Sugar-free candies and gums. Kids were warned not to eat too many candies since it can lead to pain and discomfort brought by tooth decay, but nowadays some candies can help for its prevention. Dentists have recommended sugar-free gums due to its properties of stimulating saliva production or cleaning the teeth when chewed. Xylitol is a sweet crystalline used as an artificial sweetener for “sugarless” gums and candies. It can reduce decay-causing bacterias in the mouth since they cannot utilize Xylitol for their growth. Seafood (fish, lobsters, shellfish and more). These products contain lean protein which is essential for the health and strength of the teeth. Most seafood is also known to contain Fluoride which is a naturally occurring mineral that helps form a barrier around the teeth. Fluoride prevents the effects of acid attacks and even reverse the earliest signs of tooth decay. Prevention is always better than cure, that is why performing preventive measures are vital for the proper maintenance and care for better dental health. Avail of our Diagnodent service for the early detection of decay to perform urgent treatments to keep it under control. Suspect you have a cavity? Let us help you diagnose and provide the necessary treatment for the maintenance of your teeth. Avail of our Kavo Diagnodent in Spokane, WA. Book an appointment with us at The Holistic Dental Center. Our dental office is located at 731 W. Indiana Avenue, Spokane WA 99205.